“Ick” is a word that comes to mind far too often when writing about New York University under the tutelage of its President, John Sexton. In February, we wrote about how U.S. Treasury Secretary, Jack Lew, got sweetheart deals while serving as NYU’s Chief Operating Officer, including a $1.4 million mortgage that was completely or partially forgiven, depending on which way you calculate his departing gift of $685,000. During his tenure, students saw their tuition skyrocket by 40 percent. In 2011, Amanda Fairbanks, an investigative reporter at the Huffington Post, revealed that in order to meet the burgeoning costs for room and board and tuition, 498 young women at NYU were moonlighting as prostitutes to wealthy sugar daddies through an online match-making service. Yesterday, we reported on NYU’s financing of multi-million dollar brownstones for law professors – tossing out these outlandish perks like penny candy at a carnival booth. 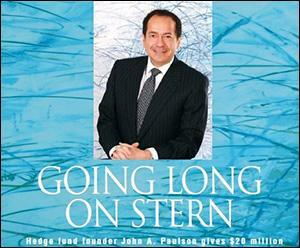 While researching that article, we came across yet another ick factor: NYU’s Stern School of Business and its love fest with hedge fund kingpin John Paulson who runs Paulson & Co.
On April 16, 2010, this is what the Securities and Exchange Commission had to say about Paulson’s business morals when it announced formal charges against Goldman Sachs pertaining to the infamous 2007 ABACUS deal: “The SEC alleges that one of the world’s largest hedge funds, Paulson & Co., paid Goldman Sachs to structure a transaction in which Paulson & Co. could take short positions against mortgage securities chosen by Paulson & Co. based on a belief that the securities would experience credit events.” Translation, Paulson helped Goldman select dogs that would default or receive credit downgrades and then made easy bets that they would. According to the SEC’s complaint, Paulson & Co. paid Goldman Sachs approximately $15 million for structuring and marketing ABACUS. By October 2007, 83 percent of the bonds in the portfolio had been downgraded and 17 percent were on negative watch. By Jan. 29, 2008, 99 percent of the portfolio had been downgraded. The SEC estimated that investors lost more than $1 billion in the deal. On July 15, 2010, the SEC announced that Goldman Sachs would pay $550 million to settle the charges. Fabrice Tourre, the young Goldman investment banker involved in the deal, will face a civil fraud trial next month. Paulson skated free – because he didn’t actually sell the product or misrepresent it to investors – he just stacked the deck against them and, apparently, that’s not a crime in the eyes of the SEC. Paulson helped to rig an investment designed to fail; cost investors $1 billion; he will shortly read in the newspaper the details of a young man’s civil fraud trial as a result of that bogus deal; all while he is content in the knowledge that his reputation has been enshrined as a great businessman, courtesy of NYU. Yesterday, while wading through all the Wall Street names on the Board of Trustees of NYU, I came upon the mega ick factor: John Paulson’s name resides there.